Bathua, popularly known as Pigweed, is a leafy vegetable mostly available in North India. We get them in South India very rarely and that too in winter season. We get very rarely vegetables like Sarson (Mustard leaves), Knol Khol and bahua in our local markets. Whenever we get them I buy them and make as many as possible recipes with them. This season we are getting bathua leaves abundantly, so I am trying my hand. This leafy vegetable looks like gongura or sorrel leaves, but tastes differently. 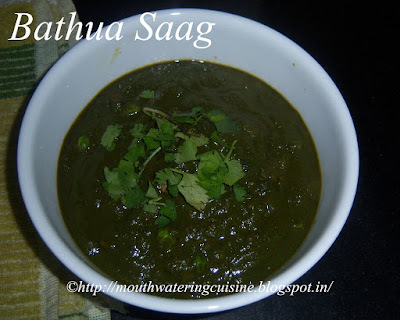 Sorrel leaves have sour taste, but bathua does not have any specific taste. I have to plan ahead to cook bathua saag. We have to discard the leaves from stem. Discard bathua leaves from the stem. Wash them thoroughly. Keep aside. Heat oil in a kadai, add cloves, cinnamon stick, mustard seeds and red chilli. Now add chopped onion, fry till they become translucent. Add green peas and chopped tomatoes. Fry them till they become soft and mushy. Add turmeric powder, salt, red chilli powder, coriander powder and garam masala. Boil water and blanch bathua in it. Let it cool. When cooled make a paste of it, just like that of palak puree in palak paneer. Add bathua puree and little water. Allow this to boil for about 2 to 3 minutes. 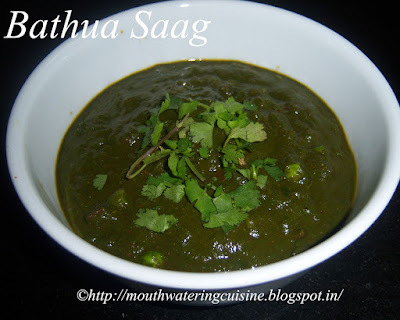 Serve bathua saag with roti, I served it with Jowar Roti.